I’m so happy today that at last the Fairyhobmother visited my blog and granted me an early birthday gift. Fairyhobmother’s mission is to spread love and happiness in the blogosphere. Almost all of my blogger friends have been visited by him and now I am so blessed that he included me on his list. Fairyhobmother’s magic bag has been filled with lots of great stuff lately, including the Samsung G-Series RSG5UCRS American fridge freezer that looks so stunning in a stainless steel and many more. If you’re a blogger, you too can receive a special gift from him. Just follow him on twitter @Fairyhobmother and leave your comments on this post so he can visit your blogs. You are one of those lucky bloggers in the blogosphere. 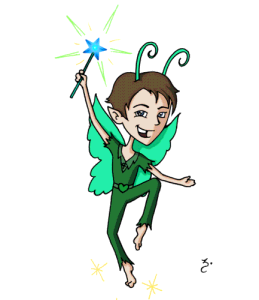 The magic wand of Fairy Hobmother sparked on your blog, and your wish is HIS command. Congratulations. I wish HE has time to visit me one of these days. Yay! That’s a great bday gift! I followed him on Twitter and I hope he will visit my blog someday. Wow! Fairyhobmother’s so generous I hope I get a visit from him one of these days. If I have extra money, I’d love to have that Samsung G-Series RSG5UCRS American fridge freezer coz it’s very spacious. Congrats again! Great for you that he finally visited your blog. As for me, I am still waiting for him to finally visit my house. next time he should visit mine! Wow! I hope he could visit my blogs too… I need some magic for Christmas!